The Vision of Frank Lloyd Wright is not only a beautiful book but a useful one, also. Thomas A. Heinz, a noted Chicago area architect as well as a writer and leading authority on the work of Frank Lloyd Wright, represents virtually every structure that Wright built in his extensive survey of Wright’s life’s work. In this, Heinz’s second book on Frank Lloyd Wright, he includes a short biographical chapter and more photos and information on stained glass and furniture. He shows how Wright’s genius at architectural design enabled him to work out extremely complex buildings in his head and translate them on to paper in a matter of hours. He illustrates this by telling the famous story of his design presentation of Falling Water. Frank Lloyd Wright’s career has been examined in numerous studies and articles both during his lifetime and since his death in 1959, shortly before he completed New York’s Guggenheim Museum. The study of Wright’s life and work not only offers new insights into the character of this complex, confident personality, but also the legacy he left behind in the vast number of home and public buildings photographed mainly by Heinz, himself. Wright’s work continues to draw great admiration and interest to this day. Heinz gives full coverage to Wright’s often tempestuous and sometimes tragic life and career. Hundreds of photos, both archival and recent chart his amazing work and influence on all who followed. This 450-page book is the first to show all the buildings in beautiful color photography. 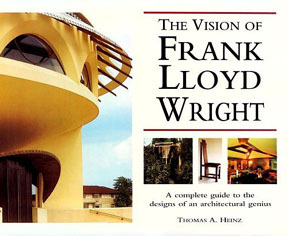 Heinz wrote the Vision of Frank Lloyd Wright in a clear, casual style which is refreshingly non-academic. It talks about the people behind the buildings more than the buildings. Often books on architecture discuss the materials and structure of the buildings, things readers can see in the photographs. But Heinz takes a different approach by presenting information on Wright’s clients. An excellent book for any Frank Lloyd Wright fan, it may even convert those who aren’t into fans of the great architect.